Color matching is very important because not all of the colors we can see in nature can be reproduced. Our computer monitor re-creates colors by mixing Red, Green and Blue (RGB) lights. Printing traditionally re-creates colors by mixing Cyan, Magenta, Yellow and Black (CMYK) inks. The chart to the left shows the amount of colors each process can re-create. Color matching is important because as you can see, your monitor cannot display every possible color you can find in nature, and a printer can re-create even less. It is important to remember that it is difficult to get extremely vibrant colors in CMYK printing. What Color Am I Looking At? Light color is perceived differently that printed color. Perceived color can be influenced by the light of the room, or even by the health of the person looking at the color. 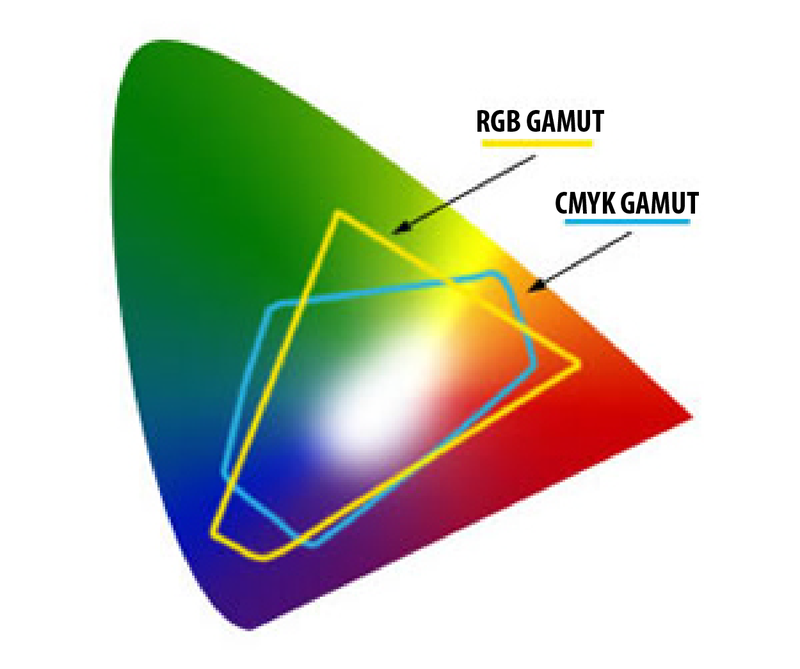 This combined with the fact that every computer screen displays color differently, creates a unique challenge to the printing industry. for instance red on my high resolution screen may be seen as a dark orange on your screen. This is a challenge across the whole printing industry. TUFFLabels cannot guarantee the color printed will match the color on your computer screen. This is why TUFFLabels recommends a per-production sample run if color matching is critical. 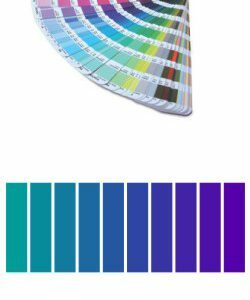 One tool that the industry has developed to solve the challenge of color variances, is the Pantone® color match system. The Pantone® Color system is a printed booklet of thousands of color standards. Each color has the CMYK values as well as a small swatch of the calibrated color printed. With our color profiling system TUFFLabels is able to print to most Pantone® color swatches. Spot colors, such as Pantone® colors, can help us have something to aim for, but not all Pantone® colors can be matched exactly. Embedded color profiles can help full color artwork. Communication is the most important. If color match is important to you, make sure you communicate your color intentions to your sales representative. If you don’t have a Pantone® match or embedded color profile, at least make sure you describe the color intent; as the blue on the monitor may come out in print looking more green or purple. Even using the Pantone® system TUFFLabels will always recommend a pre-production run for all critical color matches.